I'm entering photos of my three little guys! They are 5 yr old twins, Devon and Dylan,and 2 yr old, Dominic. .......And they are THE THREE STOOGES! 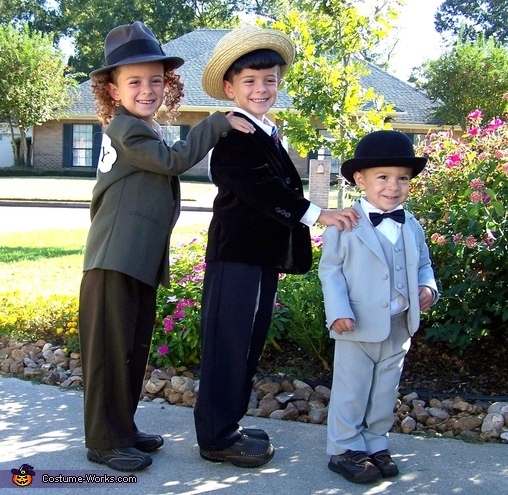 I spent weeks scanning Ebay for the perfect ensembles to bring to life this slapstick trio! I was so proud of how they looked afterwards and so were they. They love the old show and enjoy acting out the "Nyuk Nyuk Nyuk!" I love these costumes! I wanted to dress my 10,8 & 6-year-olds as this! Any suggestions for finding clothes & wigs?